Upholstered furniture not only provides a comfortable seating option; as they enhance the appearance of your home interiors. It’s actually difficult selecting upholstered furniture among the limitless styles and fabrics. In addition, it’s more difficult to maintain the quality and characteristics of that upholstery furniture for a long time. Maybe possible you are too much dedicated and clean your precious upholstery furnishing daily, but that is not enough. You need to call a professional upholstery cleaner, at least twice a year. We usually place upholstered furniture in the house’s hub i.e. the hall. You might sleep, enjoy movies, eating food on your sofa that your pet dog or cat will accompany you if you have any. Honestly, you’d have been damaging your valuable upholstery furniture at the greatest point and expecting to prolong with the usual home cleaning methods. 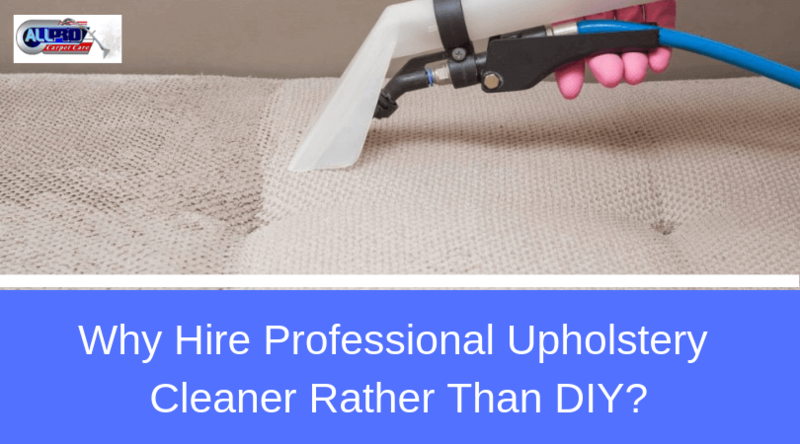 Now, if you are still not convinced with this, then read the following points to understand the significance of professional upholstery cleaner. Here are the benefits of hiring professionals. You don’t have proper knowledge about the fabric and the cleaning methods you try while performing DIY on your upholstery furniture. The outcomes are obvious, you will leave it damaged. Usually, upholstery furniture comes with a cleaning tag. And in case you avoid following it then it’s possible you’ll see such results. However, if you hire a professional upholstery cleaner, they make sure your favorite furniture is cleaned with the utmost care. Experts have knowledge about various fabrics and the respective methods to clean them. There are various types of fabrics such as velvet, suede, leather, and many more. As a homeowner, there is a very less possibility you would have knowledge of the same. So it is essential to hire someone who can help you with this. The merit of hiring a professional cleaner is they use everything that makes cleaning efficient and powerful. From the state-of-the-art deep cleaning equipment and best methods, they make sure your upholstery furniture receive the best service. However, there is less probability you would have knowledge of such things unless you are a professional. If you are willing to spend, then you can buy modern cleaning equipment. But it would be useful only if you know how to use them. The same goes for cleaning agents. It’s not safe to buy any cleaning products and use them for your upholstery. The cleaning products should be safe and suitable for the fabric type. What causes the upholstery furniture to make dirtier after you clean them? The reason is the wrong method of cleaning. Usually, when you are cleaning a stain from the furniture, you use a cleaning solution. Now it’s possible that there is still some sticky residue left behind. When you overlook those residues, they turn into molds. If allergens are airborne, then it can affect the air quality of your home will degrade, resulting in people developing sickness. A single wrong move creates a domino-effect and that will definitely spoil your home investment and your health. Calling professionals, you can avoid all these. The deep cleaning process they take up involves a lot of procedures with no room for concerns. The deep cleaning eliminates all the disease-causing germs and helps you stay healthy and safe. A regular vacuum cleaning process is necessary, however, to keep your upholstery durable for longer years, you have to take professional services. You don’t have to spend on them every month. At least twice a year would be sufficient. If you are looking for professional upholstery cleaners in Bakersfield, then no one better than All Pro Carpet Care. We have years of experience in upholstery cleaning services. Call us today at 661-747-4441 for free quotes and queries. Follow us on below mentioned social media for service updates and offers.